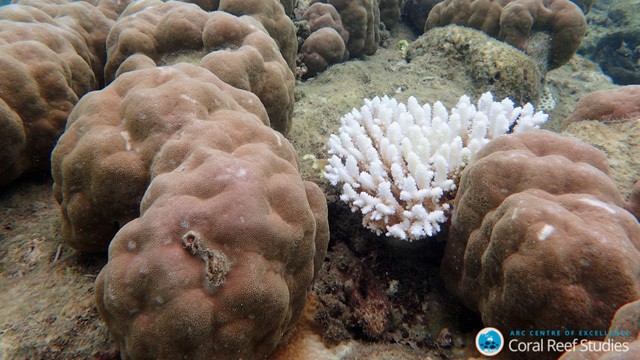 A severely bleached branching coral is nestled next to minimally bleached boulder coral.ARC CENTRE OF EXCELLENCE FOR CORAL REEF STUDIES, GERGELY TORDAA long-lasting oceanic heat wave in 2016 roasted the Great Barrier Reef, killing so many corals that the reef may never fully recover, researchers report today (April 18) in Nature. “This paper is a grim post-mortem of an event that may very well mark the beginning of the end for many iconic reefs as we know them today, at least for the foreseeable future,” Kim Cobb, a coral reef expert at Georgia Tech University who was not involved in the study, tells The Washington Post. 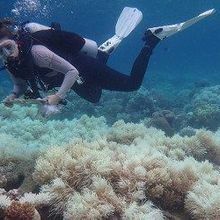 Corals die in a phenomenon called bleaching. Warm ocean temperatures stress the corals, causing them to kick out symbiotic algae, which drains the corals of their color. Without their algal partners, the corals starve and die. 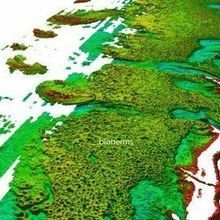 Ecologist Terry Hughes of James Cook University in Australia and his colleagues tracked coral death along the 2,300-kilometer Great Barrier Reef during and after the 2016 marine heat wave. Nearly half of the coral—around 1 billion animals—died in the past two years, Hughes tells The Washington Post. Fast-growing staghorn and tabular corals suffered the greatest in the demise, an alteration in diversity that may reshape how the reef functions ecologically. The way the corals died also caught the researchers’ attention. Usually, they starve after the algae are gone for too long. But in the 2016 heat wave, 25 percent of the corals that died succumbed as a result of the heat itself. “A future with coral reefs, their rich diversity and the livelihoods they provide to people is quite simple. 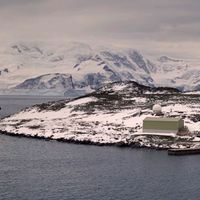 It will only be possible if carbon emissions are rapidly reduced,” Nick Graham, a marine ecologist at Lancaster University in the U.K. who was not involved in the study, tells Nature. 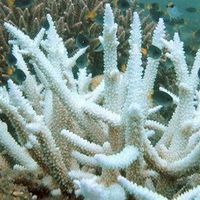 Already, the reef has suffered another bleaching event, this time as a result of an ocean heat wave in 2017 that killed roughly another 20 percent of the corals. “One of the concerns around the coral reef world is that the gap between pairs of bleaching events is shrinking,” Hughes tells The Los Angeles Times.